Concepts: Like many children of the 80s, I grew up playing gamebooks including the Choose Your Own Adventure series. House of Danger casts you, the reader, as a young psychic detective. You receive a call pleading for help, and trace it to a sinister old house. Inside lurk all kind of unusual experiences – some of them are truly bizarre! Expect to find aliens, ghosts, mad science, and a disturbing number of chimpanzees. Now, however, the game has been reinterpreted as a co-operative board game. Writing: While much of the game draws a strong core influence from Montgomery’s original work, the game quickly spirals into its own unique entity. 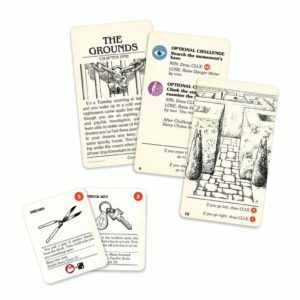 Set across five acts, each of which has its own goals and objectives, the game possesses multiple branching pathways much like the original book. Players take turns controlling the game’s unnamed protagonist, working their way through the increasingly psychedelic mysteries that confront them. Each of the game’s five acts (not including the finale) have a specific start and end point, so the players can’t spiral as far off-track, but the decisions on which paths to reach those end points lay purely with the players. 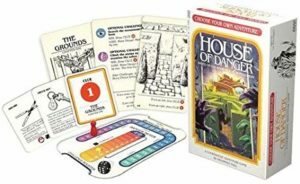 The adventure itself is very nostalgic, and maintains much of the feel of the book – although House of Danger was not my favourite Choose Your Own Adventure book, I did own a copy as a kid and read it several times. Incorporating many of the unusual plot twists (and banana-sharks!) from different branches of the book, you’re never at risk of losing out on some of the most bizarre events. For those who didn’t play this as a child, this will seem utterly manic, and may be more cartoonish for anybody over thirteen years of age to genuinely enjoy. Mechanics: As mentioned, the game plays over a series of acts. Each act is laid out as a deck of cards, and the players read through each card. When they reach the end, there is usually a decision to be made, and based on that choice the player will be directed to a new card in the deck. The game comes with a small board which contains two trackers. The first of these measures your danger level, which increases throughout gameplay as the players face hazards. Throughout the game, you will be asked to roll a die in order to complete certain challenges – these can involve vaulting over a pool of piranhas, sneaking your way past an angry gorilla, and so on. The number that you must roll on the die is determined by your place on the danger track – if you are on a space that reads ‘4’, you must roll a four or higher. Throughout the campaign, you will be given items. These items can be used during a challenge to raise your roll in a dice roll. Items that can do this are called ‘challenge boosters’, and are grouped into five categories – climbing, fighting, dexterity, perception and strength. These aren’t as complicated as they sound – if a challenge says “this is a dexterity challenge’, you will be able to gamble any dexterity-boosting items that you have in order to raise your score on the dice roll… but to be honest, we’ve never really had to do this in our campaign, so don’t worry about this. Other items have one-time uses, such as water bottles and batteries. 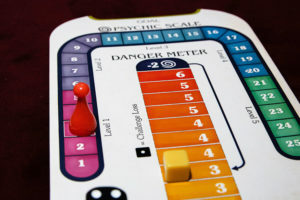 The other track listed on the board is a psychic scale, and this measures your general success in the game – you will, at times, be given hints if you have reached a significant enough space on the psychic scale. If you reach the maximum space on your damage track, your psychic scale will decrease! And… that’s basically how the game works. Design: Sadly, it’s at this point of the review that I am required to break some very, very bad news. The quality of the physical production of this game is simply saddening. Each of the game’s cards feel very thin and cheap, and they are packaged in some of the most awkward plastic wrapping that I have ever struggled to unravel. The markers for the game’s board are generic and cheap – effort could have been put into designing ones that are aesthetic to the game, but it doesn’t feel that this was done. Even more confusingly, the inlay in the box itself is made of out cardboard and arranged in the most awkward manner I have witnessed, with one section held in place by tape and weighed into position. This feels flimsy and poor, and really speaks of an attempt to simply cut corners in the game’s production. I genuinely cannot imagine that purchasing decent card stock and using (or re-using from an existing product) a functional box inlay would have been beyond this production, especially given the notability of the franchise that they are working with here. This title deserves better. Playability: While the production quality of the game is something of a let-down, the game does play very nicely indeed. The rules are very easy to pick up, and the atmosphere that it evokes is very true to the book, right down to the artwork. Each of the arcs is a decent size, none being too big to outstay their welcome nor short enough to leave you feeling as if they are lacking. They are just the right length for a short evening’s play. In addition to that, the more adventurous players will, at the end of each arc, have the chance to travel back to earlier points of that arc, sacrificing all of the progress that they have made in their first attempt to do so, in order to try a different route. This recreates the ‘keep your finger in the last page so that you can back-track if the choice you made is a bad one’ method of reading that we all had when we read the books as a kid. Admit it, you did it too. Conclusion: I really do quite like House of Danger. It brings with it a strong sense of nostalgia, but also is significantly new enough that it should amuse and entertain. If you have children who are the right age (7-12, I’d say) then this might be a great choice. Overall the game’s weakest point is the lacking quality of the tactile elements of the game, especially the inlay and the markers. If Z-Man Games were to spring for better quality in this department in future Choose Your Own Adventure releases (and let’s hope that they do – The Cave of Time is a perfect choice) then they would be on to a real hit. FINAL THOUGHTS: A lively and charming adventure for audiences of the right age, and a nostalgic kick for those older, but hampered by low production values and limited replayability.